options window : I can use return or escape (unless in the last tab) but it is not really simple. personalized report window : completely unusable on this PC. Thank you for posting. You may be able to resolve this issue by changing your screen resolution. Otherwise, can you provide some screenshots illustrating the issues you are describing? Two screens but may be some others are in the same case, you can't validate, only escape. When you're in one of those too-wide windows, do the following. Press the right arrow key (or the key that "points to" the window border that is off the screen): the cursor should jump to that window border - which of course you can't see right now, since it's off the screen. 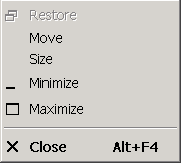 Press the left arrow key (or the opposite of whatever key you pressed in the previous step) to resize the window: the edge of the window should move in the direction you've chosen. If this tip is working fine for the options window, it's not the case for custom report window, so I can't access the OK button in this window (or validate my choices with return key). It does seem the resizing is more limited for the Custom Reports window. I will bring this to the attention of our developers to see if anything can be done.